I fell in love with little fuzzy Easter chickens when I was a kid and this love has NEVER died. I get more excited about tiny yellow chickens than I do about Easter chocolate which is saying a lot because I looooove chocolate. A piece of cardboard that came off the corner of a new mattress was floating around – perfect to make a little world (cutting down a box to leave 2 sides and reinforcing with sticky tape would also do the trick). After raiding the bits and pieces cupboard we came away with some small boxes that Cakey wanted to stick to the back wall of Chicken World. Pva glue was going to take too long to dry so I used my hot glue gun. Sleeping chickens with enormous styrofoam eggs!! 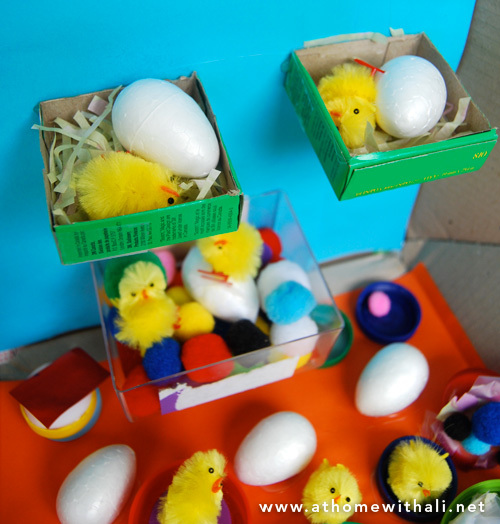 Once the boxes were firmly stuck to the wall Cakey filled the top two with little strips of tissue paper to make comfy nests. 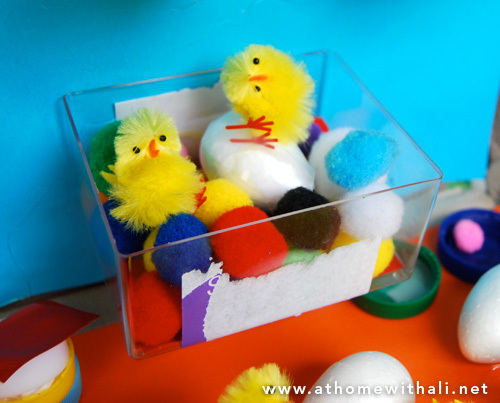 She wanted to use the transparent cotton buds container as a chicken playroom so we found some pom poms and turned it into a ball pit. We both thought the chickens looked very happy in their new nests and playroom. Next the pva glue and sticky tape made an appearance accompanied by my lid collection. (I keep a bowl in the kitchen to throw any plastic lids into, it is amazingly handy for craft projects. The bowl of lids also keeps Boo occupied when I am trying to get dinner on the table). Cakey created a fantastic playground for the chickens – lots of round-a-bouts and climbing equipment. She had a lovely time stacking the lids and filling them with pom poms wrapped in sticky tape. My intention was for the chickens to roam free in Chicken World so that they could be used in imaginary play but Cakey insisted that they be glued down. Chicken World is now sitting high on a shelf. It comes down from time to time for Cakey to play with. Boo is not allowed anywhere near Chicken World – she tries to rip all the lids out and eats the styrofoam eggs. 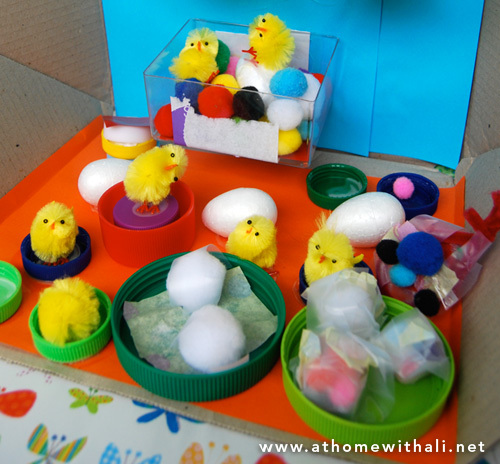 If you love Easter inspired craft have a look at rainbow chicken houses and don't miss my Easter Pinterest board. 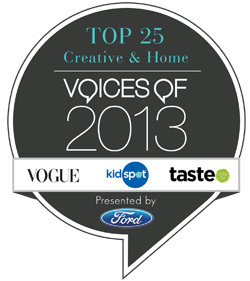 Thank you, we had a lot of fun making it and have made some other homes for some more chickens too. So precious. Love those chicks. Where did you get them? Thanks Susan, I find the chickens in the $2 dollar shops that are in most shopping centres here. I am in Australia so not sure where to get them elsewhere. They are really cheap, $2 to $4 dollars per packet. I've been following your blog for about two months now. It is my absolute FAVORITE. I get so excited when I see in my Reader that you have a new post!!!! Thank you for such great ideas, my 3-and-a-half-year-old will LOVE something like this! Oh wow thank you sooo much. I just put my little one down to sleep and forced myself to the computer to start writing next week's posts. It was lovely to be greeted by your comment. You have just put a spring into my step and totally made my day. You make the most creative small world play scenes. I am pinning this. I had a chuckle when you said you had to keep this out of reach from your younger daughter. Thanks Rebekah, small worlds are definitely our favourite thing to do. And yes my youngest daughter is in the destruction phase!! I meant to add - thanks for pinning it too. Love it - what wonderful imaginative, creative play. Now I have check out more of your posts. Thank you.... and I hope you like some of my other posts too. Thank you for pinning. Bottle tops are so versatile. 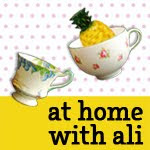 I am now following your blog and I am looking forward to seeing your bottle tops projects. Oh what fun! 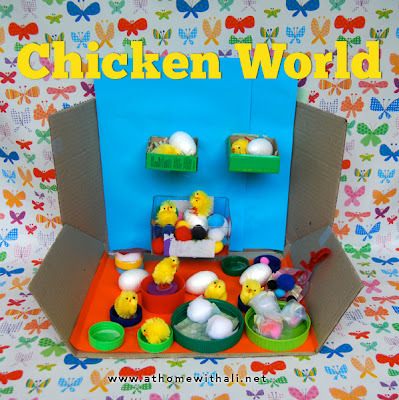 I love chicken world and we too are big fuzzy chick fans! I'm so glad you commented over at Climbing Rainbows and tempted me over here! I just bought some of these the other day and wasn't sure what to do with them, but this is a really cute idea. Thanks! So cute! I love the chicken playground. Hey where do you get these cute little chicks? I find them in the cheap buy anything and everything 2 dollar shops that are in most shopping centres here in Australia. I asked on fb where to get these chickens in USA, a couple of tips - try Hobby Lobby or Oriental trading.com. Great! This is exactly the type of play my daughter loves and does without any help from me. 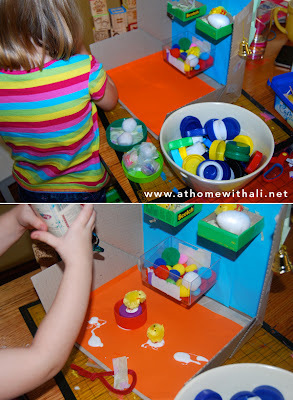 I find little toys in containers behind furniture all the time! She creates these secret hideaways for miniature toys. This is so cute. I've got the chicks so I'm definitely making this. I'll also have to keep it out of view from my youngest - I found him eating a chick this morning. They look very sorry for themselves when they've been soaked in drool. This is very cute! Thanks for the inspiration.